Did it really surprise anybody that Nasdaq technology crashed the market yesterday? This time the failure was at the SIP (Securities Information Processor). The SIP is one of the most important and least understood pieces of our equity market. It aggregates all of those fragmented exchanges and distributes the NBBO (national best bid and offer). The NBBO is what all those dark pools use to price their merchandise and also what all those internalizers rely on to give sub penny price improvement. The SIP is the hub and the exchanges are the spokes. Some HFT strategies (i.e. latency arbitrage) rely on the SIP to be slower than what an HFT can calculate themselves. So is it any surprise that the SIP failed? The Nasdaq UTP plan was developed by the following participants : BATS, CBOE, Chicago Stock Exchange, Direct Edge, FINRA, ISE, Nasdaq, the NSX, NYSE and NYSE Arca. These participants select who the “processor ” of the plan will be. Nasdaq is the processor of the UTP plan and while press reports have Nasdaq blaming NYSE Arca for the problem yesterday, the culprit is irrelevant. What is relevant is that the system failed. The plumbing of the equity market leaked again. We take issue with a for-profit stock exchange being selected to run arguably the single most important part of the equity market. While it may have been appropriate for Nasdaq to be the processor of the SIP when it was a dealer market, we think that in a highly fragmented, competing exchange market, it is no longer appropriate for Nasdaq to be the processor. Doesn’t the SEC see a potential problem by having a for profit exchange run the SIP? Isn’t there an inherent conflict of interest here? Some HFT firms rely on the fact that the SIP is slower than their self-produced quotes. And Nasdaq’s largest customers are HFT firms. We believe that the SEC should require that the processor of the SIP be an independent non-UTP participant. And that independent firm should be paid with proceeds that the exchanges currently receive as tape revenue. In addition, we believe that the SEC should mandate that the UTP participants disclose the amount of revenue that they receive each quarter from the plan. These participants currently divide approximately $450 million (this was the last known figure that was published by the SEC in 2008) amongst themselves. This revenue comes from all of us in fees that we are assessed by the plan participants. No doubt the biggest disappointment of our new market structure has been the stock exchanges. As they desperately court HFT flow, they have neglected their regulatory responsibility and failed to keep up on their own technology. 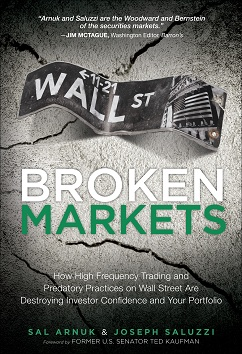 As HFT’s have demanded lower latency and more ways to race to the top of the book, the exchanges have compromised the entire market to win their business. The biggest losers however are not the exchanges. Instead, the biggest losers are us, the institutional and retail investors. We have to look on as our market integrity is destroyed by the short term profit motives of the exchanges and their high frequency clients. The US equity market, which was once the best model for capital raising and capital allocation, has now become the laughing stock of the world.